The ServiceNow platform focuses on operations, whereas LeanIX facilitates strategic decision making. The LeanIX out-of-the-box integration with ServiceNow translates between both worlds and aligns the various concepts. 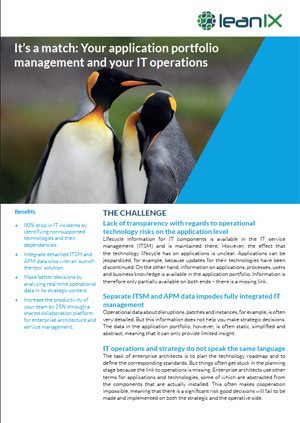 Just fill in the form to find out how you can easily integrate your IT Service Management with your Application Portfolio Management.